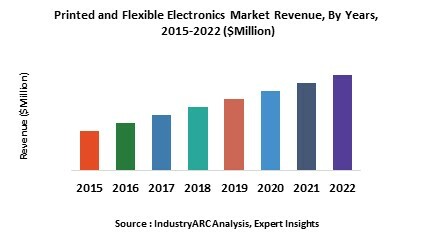 The global Printed and Flexible Electronics Equipment Market is estimated to surpass $1 billion by 2023 growing at CAGR 5% during 2018-2023 owing to the rising demand for high quality printed electronic products followed by the declining cost of curing equipment. The buoying adoption of advanced consumer electronics and smart systems based on printed and flexible electronics in North America and China is poised to play a key role in the healthy growth of the market in the future. What are Printed and Flexible Electronics Equipment? Printed equipment are the distinct set of machineries and systems employed to develop electronic components on a single substrate by the use of various conductive polymers and inks. This eliminates the need for integration of discrete components onto the substrate which results in increase in the size or thickness of the end products. Printed and flexible electronic feature low height, flexibility and higher transparency than conventional electronics. The printing equipment can be broadly classified into contact and non-contact types. Contact printer works on the principle of actual physical contact between the substrate material and the pattern with the inked surface. On the other hand non-contact printers dispense the ink or the printing solution through a nozzle on the structures formed on the substrate by the pre-programmed motion of the stage or substrate holder. Contact based printers are suitable for mass scale production and the non-contact printers are best suited for low to medium scale production. Curing systems are the equipment used in the production of printed and flexible electronics systems for toughening or hardening of the polymer material by application of heat, UV radiation and so on. The major types of curing equipment employed for printed and flexible electronics production are thermal and IR drying, UV curing systems and photonic curing systems. What are the Applications of Printed and Flexible Electronics Equipment? Printed and flexible electronics equipment are used in production of various types of electronic products such as displays, lighting, sensors, photovoltaic cells, batteries, transistors, touchscreens and others. The printed, flexible and organic electronics market was initially driven by prominent investments and development of fine chemicals. Since past 5 years the industry evolved with the equipment suppliers of the ecosystem seeking opportunities to design new equipment from the bottom up to address the changing demands of the customers. OLED is an emerging display technology that features higher energy efficiency and brighter performance than the conventional ones. In the first generation flexible OLED displays the bending feature was obtained. These displays are manufactured with a curvature, providing a new user experience but restricting the bending action by the users. The next generation flexible displays are under the pilot phase which feature flexibility or bending even to the users. With the growing demand of products such as solar panels, wearable devices, smartphones and so on, and the numerous advantages of printed and flexible electronics. The market for the printing, curing and other equipment used in manufacturing the component of these products are set to witness prominent upsurge in the future. NextFlex, Inc. a U.S. based Institute for hybrid electronics manufacturing recently announced $12m funding for seven projects related to flexible hybrid electronics projects. One of the projects will be led by MicroConnex, focusing towards development of low cost flexible circuit fabrication process employing roll-to-roll printing for mass production. PragmatIC Printing Ltd, a U.K. based world leader in ultra-low cost flexible electronics, recently launched FlexLogicIC “fab-in-a-box” a fully automated and independent system capable for high volume production of low cost thin and flexible ICs. The company also installed and commissioned its first FlexLogicIC system at its production facility at Sedgefield, U.K. Recently, Fraunhofer FEP scientists developed a new technique of micro patterning of OLEDs on silicon substrate. This would eliminate the use of shadow masks and color filters in the future, thereby allowing new full-color displays to be developed in the future. Nokia’s along with 12 major players in the electronic industry recently announced the “factory-in-a-box” concept, which is a modular and agile production package which can be transported and set up for service within a couple of hours. Mycronic is one of the contributors in this concept attributing to high-speed jet printing and dispensing system for the package enabling batch production capability of printed electronic products by the package. The companies referred to in the report includes Xerox Corporation (U.S.), Meyer Burger Technology Ltd. (Switzerland), Ceradrop SA (France), Fujifilm Holdings Corp. (Japan), Xennia Technology Ltd. (U.K.) and so on.